Steam mops come in various sizes and versions. Some people already have big and expensive multi-floor vacuums, but require steam cleaner. In such cases, investment in similar multi-floor steam vacuum cleaner is not the best option for them and buying smaller, but cheaper steam mop is probably the best option. Also, if you have floors that are regularly cleaned by other means, but do tolerate steam cleaning, give a steam mop a try, you might surprise yourself. When choosing steam mop, it is necessary to choose according to ones needs and preferences. It is very hard to pick 'THE BEST' steam mop, since they vary in features, sizes and in the end - price. Here is our list of Top 5 steam mops. All links open in new windows, so feel free to check them. 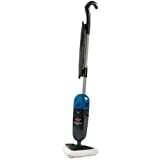 Bissell 19404 PowerFresh Pet Steam Mop is one of the best and one of the most popular steam mops, it comes with very acceptable price and it gets it's job done. 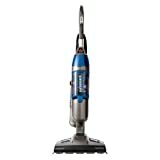 Bissell 19404 steam mop was designed for hard floors and not for carpets. It is lightweight cleaner, with good power cord length and combined with swivel head, it can cover large area and is capable to maneuver into tight spaces. Shark S3601D Professional Steam Pocket Mop is excellent steam mop suitable for cleaning hard surfaces like tiles, marble, stone and similar. Although it does have 'The Carpet Glider', it is not especially good for carpets and rugs. But, it cleans hard floors thoroughly and with acceptable price, it is one of the most popular steam mops around. If you want your pads to last little bit longer and to improve the cleaning, sweep or vacuum the area first. This goes for all other steam mops, not just for Shark S3601D model. Bissell 1132A Symphony All-in-One Vacuum and Steam Mop is, as its name suggests, vacuum cleaner and steam mop combination, in one appliance. Due to its relatively small size, acceptable price and many features, it is one of the most popular devices in its class. It uses strong cyclonic vacuum action for debris pick up. Bissell 1132 uses so-called Dry Tank Technology - debris stay dry even when vacuuming is combined with steaming to avoid any unpleasant smell later. Water tank capacity is around 400 ml and tank is not removable. Bissell 1132A Symphony also comes with a cup that helps measure the proper amount of water. 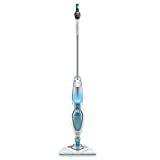 Bissell Steam Mop Select Titanium 94E9T is classic steam mop that comes at very affordable price and do its job well making it one of the most popular steam mops in its price class. Water tank is transparent and can be easily filled with tap water. If you live in area with hard water, using demineralized or distilled water is recommended - such water leaves no marks or scale on the floor or inside the steam mop. It can be used on many surfaces, like ceramic, marble, stone, tile, vinyl, laminate, and sealed hard wood. Black & Decker BDH1850SM and BDH 1855SM Steam Mops are two very popular steam mops due to versatility and acceptable price. Note that BDH1855SM is newer model and that Black & Decker has discontinued 1850SM model. However, both models are very similar. BDH1850SM 2-in-1 Steam Mop comes with two washable microfiber pads, resting mat, accessory bag with carpet glider, grout brush, detail brush, squeegee, fill cup, 4ft hose. It has 25 feet (~7.6m) power cord, weighs around 6.4 pounds (~2.9kg), tank capacity is 10.1 oz (0.3 l) and it consumes 1500W during operation. 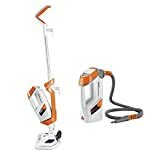 BDH1855SM 10-in-1 Steam Mop with Fresh Scent comes with 2 steam mop pads, 3.5 feet (1m) hose, nozzle, detail brush, grout brush, squeegee, water cup, 3 fresh scent tabs and a clothing steamer. Some steam mops are actually small steam vacuums that combine cleaning the floor with microfiber pad and steam with suction of conventional vacuum cleaners. Such systems are perfect for areas that tolerate hot steam - floors are sanitized, dirt and debris are cleaned and surface is left shining like almost brand new. Air filtration of steam mop/vacuum systems is enhanced using microfiber pads (hot from steam) and often combined with additional mechanical or cyclonic filters. However, air flow is rich in water vapor that is getting cooled down and forms a droplets that stick to the dust and other debris and, of course, to the steam mop/vacuum parts - after each cleaning, it is highly recommended to empty and clean the dirt bin of such units. To increase the time between pad changes, some steam mops have pivotal mechanism so that after one side of pad is used (becomes dirty), another side of the pad can be used. This system is good for steam mops that don't use vacuum suction, since vacuuming through such 'reversed' pad can actually increase amount of particles that travel from the mop pad toward the mechanical filters. To improve cleaning effect, especially the cleaning of hard to remove stains (ever had stains from berries? ), some steam mops have scrubbing system installed that rotate, vibrate, shake etc. Also it has microfiber pad and thus create scrubbing effect with up to, or even more, than 1000 scrubs per minute (15-20 scrubs per second). Such systems can be used for polishing, too. It is advisable to vacuum first the area with the sensitive surface and then use steam mop with scrubbing system, since any hard debris (small rocks, for example) with hard surface can damage and scratch sensitive surfaces like wood floors and similar. Many people wonder if tap water is good enough for cleaning with the steam mops and the steam cleaners or they should use distilled water. Modern steam mops and cleaners have easy-to-clean water heaters (or they are often marketed that way) and according to the manuals, tap water can be used. However, distilled water is not that much more expensive and it leaves no residue of any kind on cleaned surfaces nor on heaters. IMHO, use distilled water when cleaning with steam mops or steam vacuums. Steam mops also have other features important for their operation and before buying one, one has to think thoroughly about them. Length of power cord - lithium ion batteries provide great capacity for common cordless vacuum cleaners, but for cleaning areas with steam mops, mains power is required. Power cords must be long enough to enable a person to reach required area and to clean it. Also, power cords must be stored easily. Length of cords vary and if you find a steam mop model that you really like, but with short power cord, power cord extension is also a viable option. Cordless steam mops - cordless steam mops use onboard batteries to power scrubbing systems and water pumps. They don't use batteries for creating the hot steam, since it would drain the battery in matter of seconds. For example, common steam mop requires 1500 W to operate. 22 V, 3 Ah lithium battery (very strong and very expensive battery) can theoretically provide 1500 W of power for 2 minutes and 38 seconds, but in real life, it would be drained in lest than or around 2 minutes. Nobody wants to wait 25-30 seconds for water heater to heat the water and than to clean for 90 seconds. Capacity of water tank - water and water tank add to the size and weight of the device, but if the steam mop has too small tank, then it must be refilled too often which interrupts and prolongs cleaning. For most homes, steam mops on the market have water tank of the acceptable size and if you are cleaning smaller area, then simply add less water to avoid cleaning with too heavy steam mop. Cleaning head width - wider cleaning heads enables one to clean larger area in less time. However, wider cleaning heads can have issues when cleaning hard-to-reach areas like corners, around and under furniture and similar. However, to mitigate such issues, steam mops and other vacuums like upright vacuums, stick vacuums and certain models of power cleaning heads for cylinder vacuum cleaners have swivel mechanisms that help maneuver the mop/cleaning head around the furniture and other obstacles and enables the accessing hard-to-reach areas with narrow side of the cleaning head. Price - price of steam mops and especially steam vacuum cleaners vary from few tens of dollars/euros to hundreds or even thousands of dollars/euros. For most homes, models that costs premium are probably the best option. They are NOT cheap, but for the reasonable price they do their job well and improve quality of living in our homes. There are, of course, many other options that steam mop have that can influence choosing one of them (size, weight, material, color, control buttons layout etc), but such options are highly individual. There are many more excellent steam mops or steam vacuum/mop combos on the market that will do their job well. It is up to You to choose the right one according to Your personal needs and requirements.